Embarrassing and humiliating are the only two words that can describe the reaction of so-called elite Vietnamese anti-terror police to a violent assault by protestors in Bình Thuận Province on Sunday. Allegedly trained to respond to terrorism threats as well as civil unrest, the Canh Sat Co Dong (CSCD) (Vietnam Mobile Police) in the video above demonstrate none of the qualities associated with a highly trained, well disciplined force ready to respond to incidents of terror or unrest. The video above starts with the perimeter line having been already breached by aggressive protestors, part of the line standing in the background as that part closest to the camera are violently assaulted with bricks, cobblestones, rocks and barricades. As hundreds of people watch on the Vietnamese anti-terror police assigned to protect the government building in the heart of Bình Thuận from protestors angry at a plan to allow foreigners to obtain 99-year land leases in three designated special economic zones (SEZs). 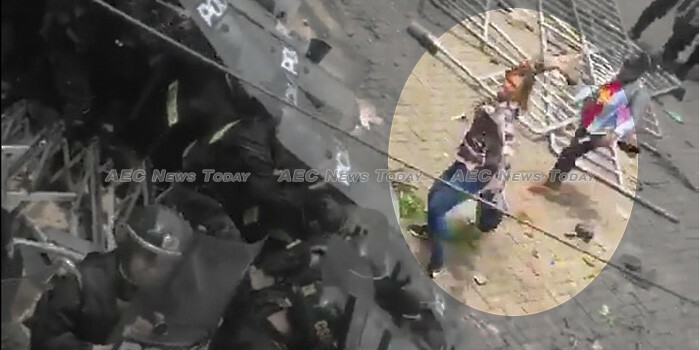 A group of people in the front line, ,many of who are women, can be seen throwing stones, bottles, and sticks at the so-called ‘elite’ Vietnamese anti-terror police, who for a short while manage to hold a defensive line against the attackers. However, rather than regrouping and forcing the protestors back with their shields, the police in the video above gradually retreat, inching back as the onslaught continues, lacking the discipline or training to maintain a shield cover the heads of those on the front line. As their companions face the brunt of the protestors anger, the ‘elite’ Vietnamese anti-terror police from the other side of the broken perimeter line watch on. After some four minutes they attempt to intervene to save their companions wedged between a water tanker and the building they are meant to be protecting, only for them too to come under fierce attack, only a well thrown bundle of fireworks saving them from what was starting to turn into a nasty situation. According to authorities 102 people were detained in Bình Thuận after the building above was looted and vandalised. In response to the protests the National Assembly (NA) yesterday, June 11, voted to delay the law’s passage until the next session in October, with the maximum lease period being reduced to 70 years in line with existing law. While some say the protests are in response to the proposed new laws which many Vietnamese see as ‘selling the country’ to China, others say the ferocity of some of the protests point to deeper underlying issues. Either way one hopes that by the time the law comes around for passage next time the so-called ‘elite’ Vietnamese anti-terror police in the video above will have undergone some better training, and perhaps supplied with some more appropriate equipment too.